Sixty-five diverse arts projects have been supported through the latest round of the VicArts Grants program, ranging from the development of manuscripts to dance and circus performances, workshops and international exhibitions to solo theatre shows and dynamic festival programs. Selected by expert panels from more than 350 applications, the latest round provides a total of $1,570,304 for projects that will involve 1,500 Victorian artists and will take local talent across the state, the country and beyond. Alongside activities by renowned artists such as master performer of the Chinese Mouth Organ Wang Zheng-Ting and former Stella Prize winner writer Emily Bitto, the round will support initiatives for emerging artists such as the Flinders Quartet’s composer development program, an electronic music workshop program for young people by musician Bridget Chappell, and The Lifted Brow’s Brow Books publishing program, which will publish eight titles by first time and emerging writers in 2019. Many projects will go on to be presented at major arts events such as the Prague Quadrennial, Dance Massive and the Adelaide Fringe Festival, and local festivals have also received support including the Radiant Pavilion contemporary jewellery festival, ButohOut! 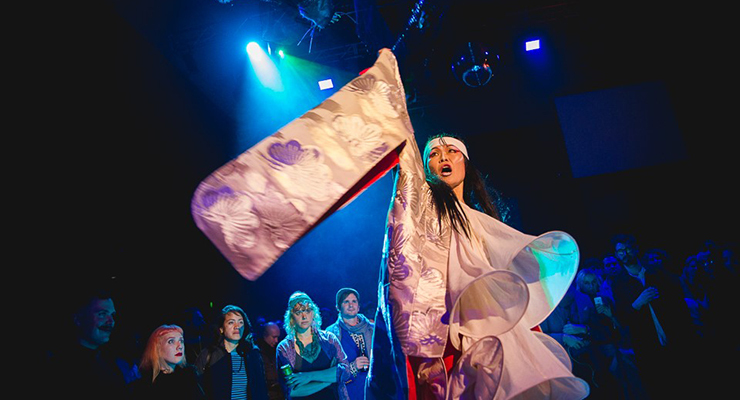 – a celebration of the Japanese dance and theatre tradition Butoh, the Jolt Sonic Sound Art Festival and the video art event focused Channels Festival. Check the VicArts Grants page for upcoming application closing dates and to download application guidelines, templates and drafting tools. Presentation of Queer Economics, a multi-part, community-oriented, curatorial project that will present and involve Australian LGBTQIA+ artists, curated by Abbra Kotlarczyk and Madé Spencer-Castle. The project will consist of two exhibitions, a publication and a series of public programs. For the presentation of ‘Under the Olive Tree’, a concert of traditional and contemporary music, performed by Arabic and Jewish musicians. For the development and presentation of a new electro-acoustic work for flute cello, piano, percussion and interactive electronics to be premiered in 2019. For the development of 'Andrina of the Stars', a children's novel for readers 7-11 years old, exploring science, astronomy and our place in the world – individually and as a planet. For two years' worth of activities including twelve events, residencies and the production of books, scores and CDs. Support for the presentation of 'Lady Example', a new dance work to be performed over a five-night season. Creative development of a play that explores the relationships between a sovereign and invaders told through the story of dingoes and a young female hunter. The play will be developed by Catherine (Anglo-Celt Australian) in collaboration with playwright Andrea James (Yorta Yorta/Kurnai). To collaborate with performer Daniel Tobias to develop a dark comedy and theatre work that explores long-term commitment, romantic disenchantment and the loneliness of an elderly couple. Presentation of 'Night in March 2019', a theatre work exploring feminism and faith, by Victorian theatre company The Rabble. For Indigenous production company Brown Cabs to partner with ILBIJERRI Theatre Company, to reimagine and develop a new production of the critically acclaimed theatre work 'Heart is a Wasteland' ahead of a national and international tour. For a project that will see theatre makers Lara Schwarcz, Penny Baron and Glynis Angell partner with Footscray Community Arts Centre, Stratford Courthouse Theatre and HotHouse Theatre to create and present a new comedic theatre work. Presentation of 'Them', a theatre work set in an unnamed city at war, that tells the stories of five people in the days before a boat leaves to Europe. Written by Samah Sabawi, the work is based on interviews with and stories of refugees fleeing from Syria. For the development and presentation of the dance work 'Memoir for Rivers and The Dictator' which will be extended from its current 20-minute format into a full length work. For the development and presentation of a new three-part dance work 'Public Actions'. Creative development of an experimental contemporary dance work that explores mythological and futuristic feminist concepts. The work will be choreographed by Victorian choreographer Stephanie Lake for dance and theatre company for deaf and hearing dancers, The Delta Project. Presentation of 'Black Tourmaline', a project that will encourage and explore community discussion, resource-sharing and reflection on how Indigenous people and people of colour are manifesting modes of learning outside conventional institutions. Presentation and production of the third annual ButohOut! - a two-month festival-style program of public workshops, forums and multi-disciplinary performances that celebrate the Japanese dance theatre tradition of Butoh, presented in partnership with Abbotsford Convent Foundation. Development and presentation of the Australian Book Review's 2019 publishing program, including the publication of new work by Victorian writers, the delivery of the Rising Stars program for younger writers and an Indigenous Fellowship. Development of ‘Waterhole’, a large-scale puppetry and visual theatre work developed in conjunction with Melbourne Zoo and Zoos Victoria. For a two-year program of activities including contemporary art exhibitions, events, public and education programs and a First Nations Engagement project. Presentation of Sound School, a year-long series of workshops to teach young queer and gender diverse people, women, people of colour and people with disabilities about electronic music. Producer Erin Milne and Curator Anna Tregloan, will design and present a major showcase exhibition of Victorian artists, at the Prague Quadrennial 2019 with accompanying performances and artist talks. For the presentation of the 2019 Channels Festival a festival focused on video art that includes exhibitions, art writing and events. For the presentation of the 2019 Radiant Pavilion jewellery and object festival. This biennial festival includes curated programs and exhibitions, mentorships and a one-day symposium. Creative development of 'Entanglements', an installation artwork that will blend art and science to explore the entanglement phenomena. The work will be simultaneously presented in Australia and Austria. For the publication and presentation of 'Wasteland', a graphic novel, exploring the pursuit of a meaningful life in a broken system. For the development and presentation of six 'sensory portals' - spaces that will present multimedia activations by local artists and community groups, to be presented at upcoming Geelong After Dark events. For the publication of 'Suburban Baroque', an artist photography book that celebrates the domestic interior designs of Italian and Greek expats living in Melbourne in the 1960s and 1980s. Development and presentation of 'Fantastic Worlds', an exhibition and public program for families and children that explores the worlds of children's picture book art. Creative development of 'Big Beautiful Female Theory', a graphic memoir exploring bodies, feminism, mental illness, mothers, and daughters, from Colac to Melbourne. Final stage development of 'All the Old Symbols', a poetry collection exploring themes of the human relationship, to language and symbol-making. Support for the development and presentation of the Quartet's 2019 subscription concert season and composer development program. Presentation of 'Orpheus', a new opera-ballet by Evan Lawson. Presentation of 12 events as part of the Inland concert series which celebrates Australian exploratory music. The latest season includes events in Castlemaine, Melbourne, Sydney, Perth and Adelaide. For the development of a solo performance work that explore suicide and trauma within Indigenous communities, and the journey of grief and acceptance for those affected. The work will incorporate experimental movement theatre, puppetry, dialogue, text and video installation. For the development of a speculative fiction novel about the rise of individualism and authoritarianism in western democracies from the 1930s to today. For the creative development of 'Mormon Girl', a new solo show by writer-performer Jessica Knight working in collaboration with dramaturg Mark Pritchard and director Bridget Balodis. The show will draw on Jessica's experiences as an intersectional feminist with a disability raised in a Mormon family, and her learning to challenge the definitions of what’s 'normal'. Presentation of Till Death do us Part, a physical theatre and circus show by dance, acrobatics and physical theatre collective One Trick Pony that explores the inevitable life stages we all pass through in the trajectory from birth to death. Presentation of the 2019 JOLT Sonic Festival, a three-day sound art festival, in collaboration with Footscray Community Arts Centre. For a month-long artist residency at Leipzig International Art Programme, Germany which will include the development of new large-scale paintings and prints. To collaborate with theatre maker Emily Tomlins and over two hundred primary school students to create 'The Cabinis', a horror show written by kids, for adults. Development of 'Sonic Labyrinth', an experimental interactive sound work for children. For the creative development of 'Dis Rupt', a performance event curated by Kate showcasing eight interdisciplinary, emerging, Indigenous artists. For the development of an artwork that explores the concepts and conditions of labour and value. Presentation of the 2019 Make It Up Club series, a series of weekly concerts of avant garde, improvised music and sound art performance. For the development of 'The Mooroopna River Flats Yakapna Loitjpatj', a series of experiential paintings, photos, metal and resin works that explore identity, culture and family. The project will be undertaken with community consultation. For the development of 'The Black Bream', a contemporary literary fiction novel that explores how a family's fate intersects with the exploitation of the land, set in and around Tinaroo Dam in Far North Queensland. Creative development and presentation of Post Reality Vision, an experimental choreographic work. Support for physical theatre company WE3 to redevelopment and redesign its critically acclaimed theatre performance 'The Long Pigs', in preparation for a preview season at Adelaide Fringe, ahead of a tour to France and the UK. Support for the presentation of Welfare, a two-day symposium and exhibition on the topic of artists' welfare. To collaborate with dancer and choreographer Alexandra Harrison to develop a dance performance work that explores the body, endurance, wilfulness and survival. For the development and presentation of 'Stories Beneath the Vale', a community-driven, digital story-telling project, exploring themes of violence and growing up as an Aboriginal woman in country Victoria. For the development and presentation of a three-concert series that features classical chamber music presented alongside live DJ sets. Development and presentation of 'Healing Practices', an exhibition exploring the history of the Bundoora Homestead as a site of colonisation, domicile and restoration. For the creative development of 'Hosina', a novel for youth that explores the meaning of home and belonging in the context of the ethnic cleansing of Rohingya. Creative development of 'Shirley', a literary novel set in Melbourne's inner north, exploring real estate independence, and queer families. For the presentation of 'Dodging the Path', a series of creative engagement workshops exploring family violence, mental health and isolation. Workshops will be held in 2019 for artists from Benalla, Wangaratta and Wodonga. To develop a multi-disciplinary longform video artwork. The work will be based around séance tapes recorded in Australia and New Zealand and will involve visual and sound design and exploratory choreography. To commission a series of short essays by four Victorian writers that give original, engaging and diverse accounts of what it is to be a writer in contemporary Victoria. The essays will be published in the Sydney Review of Books in 2019. Presentation of an experimental opera that explores gender violence against women and girls. The work will involve artists from Australia, New Zealand and India and will premiere in New Delhi in 2019. Support for the Brow Books publishing program in 2019. The program will include the publication of eight new titles by first-time/emerging authors, whose work is vitally important to the larger cultural conversation of this city, state and country. Support for the development of 'It's Not An Aircraft', a creative nonfiction manuscript exploring ufology and the nature of truth and belief. The work will focus on an investigation of the father of Australian ufology's strange life and even stranger disappearance. For a two-year program that includes four editions of Un Magazine, new content for the online platform Un Extended, a writer in residence program and a series of Un Conversation events. Support to present concerts in New York and Washington and to take part in the improvisation concert series Audiopollination in Toronto. Support for the continued development of Witness, a curated website that aims to redefine and expand critical discussion of the performing arts.